So, you’ve just managed to disentangle a massively complicated plot from your head and successfully gotten it onto the page. Not only that but you’ve managed to hang upon it some very well-researched material to give it a real sense of place, and a huge dollop of imagination to make the story your own. Heck, you’ve even received an award for your efforts. Where next then? Get a clean notebook out for an all-new story? Well, if you’re Mark Hodder it appears you decide that the first story wasn’t complicated enough and then go in again with a big spoon to stir things up some more! 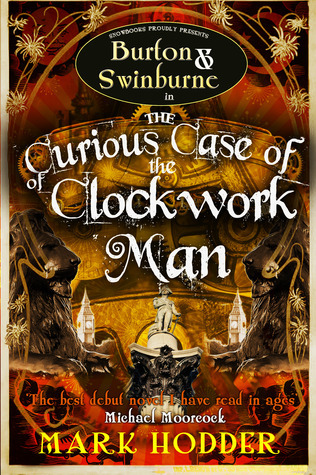 Welcome to The Curious Case of the Clockwork Man, set in the bizarre alternative universe inhabited, amongst others, by Sir Richard Burton, famous explorer and agent to King Albert (yes, that’s right), and his assistant, the poet Algernon Swinburne. Theirs is a time significantly altered by the unintended temporal shenanigans of one Spring-Heeled Jack, bringing about premature advances in assorted scientific and technological disciplines. Do you want to be flown here and there beneath giant eugenically-engineered swans? You got it, old bean. How about some autonomous steam men clunking about the place? Yeah, we got those too. Now, if you haven’t read The Strange Affair of Spring-Heeled Jack, then stop right now and seek it out. While many book series are comprised of largely separate stories, the events of both this book and its sequel, Expedition to the Mountains of the Moon, are tied more with its first book than other series I’ve read. Hodder provides some backstory in each of these follow-ups, but had I come to this story cold then I may have felt these expository parts a little tacked-on. And, anyway, the first book is rather good fun, so give it a whirl. Anyway, what you have here is another inventive slice of Albertian England involving missing diamonds, contested estates and ghostly manifestations, which then descends into something else entirely. There’s no farting about from Hodder in this story. The action and intrigue kick in from the get-go – a benefit of having gotten a large amount of the world-building guff out of the way in the first book. In this story Burton and Swinburne follow the trail of a stolen collection of black diamonds. Burton discovers the stones possess a few special properties, chief among them a resonance with human brainwaves. Or they would have done were they not fakes. Meanwhile, public interest is piqued by The Tichborne Affair, where the sudden return of Roger Tichborne, long considered lost at sea, sees him pitch a claim for the Tichborne estate. The fact that the claimant doesn’t resemble Roger Tichborne in any way seems no obstacle, particularly when many of those who see him in the flesh instantly vouch for him. The general public take Roger to their hearts, despite his social standing, seeing instead a penniless man deprived of what was rightfully his. Tensions mount across London when the claimant’s lawyer takes his client’s case to the masses. Could the two stories be connected in any way? Oh, come on, what do you think?! The Curious Case of the Clockwork Man is, for me, a great follow-up to The Strange Affair of Spring-Heeled Jack, and one I feel somehow improves the first story. As mentioned earlier, the fewer diversions into world-building enables Hodder to get on with telling the goddam story, and as a result, he keeps those pages a-turning, which, of course, is A Good Thing. What irritations I found in the story were relatively minor. Again the finale gets a little too silly for me. It’s funny, yes, but you may be well advised to suspend disbelief before stepping in. The main characters once more fall into philosophical discussions that take the reader away from the story, though thankfully only for a couple of pages at a time. Then there was the rather OTT descent into carnage that teetered dangerously close to Stephen Hunt’s The Court of the Air (whose message, I think, though I could have been wrong, even though it was rubber-stamped on nearly every bloody page, was that communism was bad). Thankfully Hodder uses such civil unrest sparingly and, in a way, eerily presages the Tottenham riots of 2011 that unfolded a month before the book’s publication! Rating: In all this is a great read, a nailed-on 4/5 from me. Be sure to pick up the next book as well as this one, however, as you will want to dive straight in once you hit the end of Clockwork Man. This entry was posted in Books, Reviews and tagged alternative history, books, mark hodder, review, the curious case of the clockwork man by Lucian Poll. Bookmark the permalink.